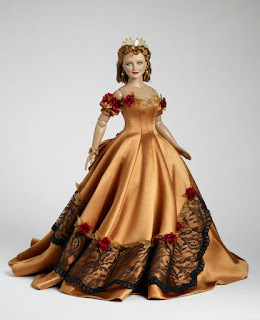 The recent release of Tonner's 2009 GWTW line likewise released a big query in the minds of GWTW doll collectors: WHY? The big question mark hanging over the heads of Scarlett doll-lovers was directed towards two Scarlett dolls dressed in ballerina versions of the "white prayer dress" (from the opening of the film) and the famous "drapery" dress. Twilight Edward and Bella in ballet costumes? However one pleasant surprise (in my opinion) was the introduction of Atlanta's woman whose notoriety competes with that of Scarlett's -- Belle Watling. Belle Watling has a plus size form and a beautiful gown with a cut that flatters her voluptuous figure. Her hairstyle seems accurate as her expression. She is not Ona Munson in likeness, but she surely captures the Ona Munson aura. And for that she seems like an interesting buy -- Funny too that the doll is said to have a little "bell" on her forehead as an accessory: a bell for Belle. On that note, I was also happy to have seen Disney's Belle now made into a regular size version 15-16-17" (not sure), and with a much better factory paint than the 22" doll (How does one play with a 22" inch doll or even display that size as big as a vase?). 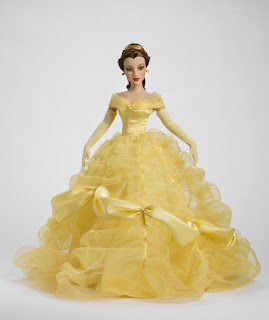 I have always liked the Disney Belle gown, and this one might be another thing to plan for if one is going to go doll-crazy again. 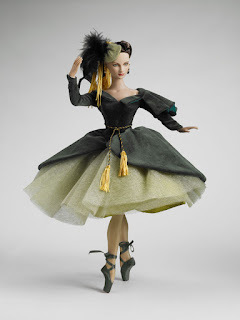 The factory paint on this doll so beautifully captures the animated character's look. Capturing another beauty's look is the Ava Gardner doll. My only gripe is that I wish they really did costumes from her films or from some press photos -- but that would mean another franchise to either designer or movie. Nevertheless she is magnificent -- much more, in my opinion, than Joan Crawford and Bette Davis (who was really never a style icon for me so the doll in different fashions was not so coherent -- for me). I think the Scarlett one is beautiful. The prayer dress one looks stupid, but the drapery dress translated well.